Once upon a time on a sailing boat not so far away, seven eager Sunday sailors were getting bored due to a lack of wind. They have dropped anchor in a lonely bay on island of Vis, Croatia and were relaxing in the sun. One of them finally decided to put an end to that and grabbed his fishing stick. He dipped various bates into the water, but with no success whatsoever. One of his mates decided to go take a look if there are any fish swimming around. He put on his diving gear and jumped in. It was not long before he came to the surface and announced that there are fish below, but aren't even remotely interested in his hook. After that he slowly swam to the other side of the bay. After a while loud cursing interrupted the peaceful atmosphere. It was our fisherman ranting about his hook, which apparently got stuck on the bottom. Luckily for him there had to be a diver somewhere nearby. We signaled him to swim over and soon he went bellow to save the hook. In a couple of seconds he was back on the surface again, shouting "Quick! Fetch a strainer or a pot of some kind!" For a couple of moments we just stood still and looked at him. Then I ran inside to get a strainer and passed it to him. 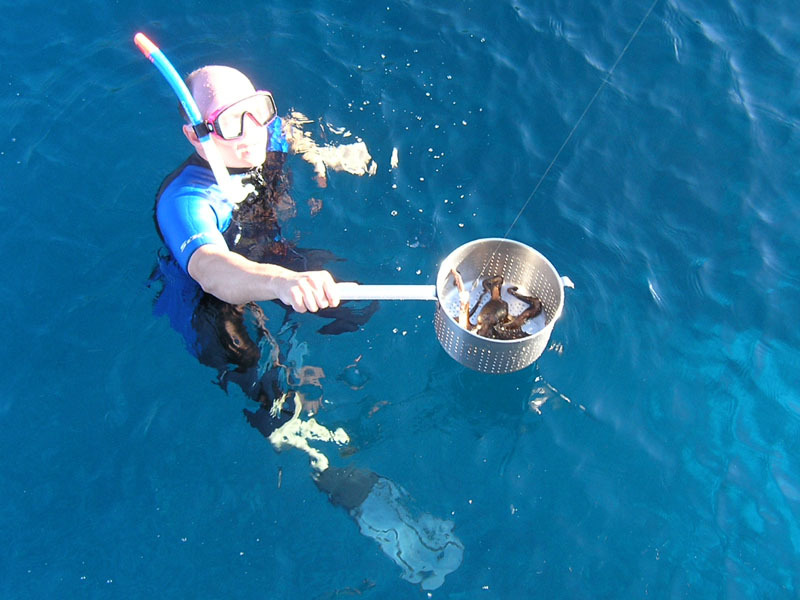 He dove back into the water and soon came back up again – holding a strainer with an octopus inside, attached to the fishing line. The poor thing accidentally got caught on the hook and couldn't get away. This catch was clearly more a product of luck then fishing skills and sadly the only one on that trip. Nevertheless it made a great octopus salad. Yummy! And they sailed happily ever after. You should take a peak at these parts one day - for a vacation if nothing else. Beautiful nature is always just around the corner here in Slovenia.